In London a number of tech startups are developing technology to keep residents informed and in some cases protected from air pollution. Startup Airlabs is demonstrating what it calls a Clean Air Bench. It might not look like much, but this smart piece of urban furniture has been designed to create a clean air bubble around it. Air is drawn in through the back, its technology traps particles in a filtration system before gas pollutants, such as nitrogen dioxide, are absorbed. Clean air is dispensed from under the armrests and several other grilles. The idea is the units can be fitted to everything from benches, to lampposts, bus shelters and city walls. Initial independent testing by London’s Kings College in July 2016 found an Airlabs test unit removed more than 87 percent of nitrogen oxides. Airlabs technology is also used in industrial settings, such as cleaning heavily polluted air from factories. Airlabs CEO Sophie Power claims they have since been able to improve on that to remove over 95 percent of nitrogen dioxide that passes through it. “Recent studies show that even if we managed to reduce diesel from over 50 percent, what it is now in London, to just 10 percent there will still be hotspots in London that are over the WHO guidelines for nitrogen dioxide. It’s a long time coming, we’ve trailed the technology for many years and it’s not getting so much better. This technology can be a really good tool in reducing key exposure in hotspots, for example, by the roadsides, in schools, hospitals and across the transport network where people are just absorbing too many pollutants in their day,” she says. Early morning in central London sees queues of traffic slowly snake their way through the busy British capital, time for Romain Lacombe to go to work. The founder and CEO of Paris-based startup Plume Labs is using Flow, a wearable air quality tracker that monitors outdoor and indoor pollution. 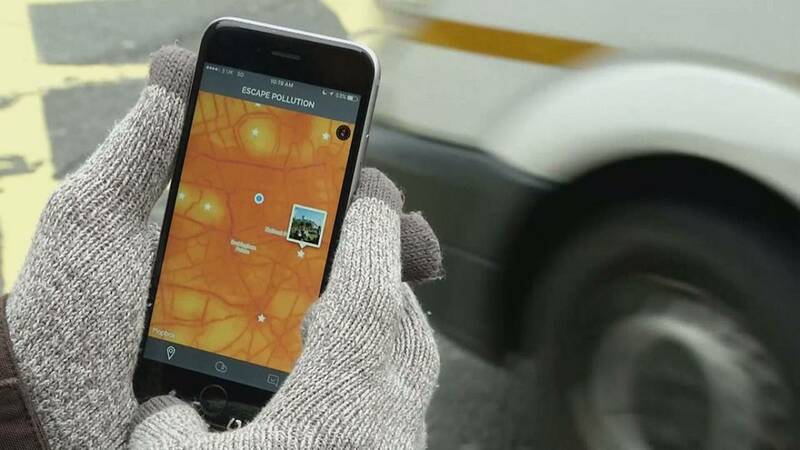 The companion smartphone app goes one step further by syncing with other Flow users to provide an up-to-date crowd sourced map of air pollution. “If you think of Wikipedia for instance, a crowd-built encyclopedia, we’re trying to do exactly the same thing for the air we breathe. By crowd-sourcing the level of pollution across town, we’ll be able to build a map of the areas where you can go in real time to escape pollution and hopefully that’s going to be useful not only for people who live in cities and who want to know how they can reduce their own exposure, improve their health and well-being, but also for policy makers, for mayors, for cities,” says Lacombe. According to the World Health Organisation, (WHO), an estimated 12.6 million people died as a result of living or working in an unhealthy environment in 2012. That is almost one in four of total global deaths. Last month London mayor Sadiq Khan issued a ‘very high’ air pollution alert for the first time, as cold, windless weather allowed emissions across the whole of southeast England to build up. The London air monitoring team at King’s College said pollution in the capital was at ‘black,’ the highest level, meaning people should reduce physical exertion outdoors. Experts at King’s College said the rise in pollution was caused by a combination of traffic pollution and wood burning.